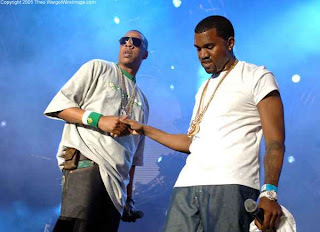 Hooked On The American Dream: NME-Jay-Z and Kanye West to Record Joint Album; "Watch The Throne"
NME-Jay-Z and Kanye West to Record Joint Album; "Watch The Throne"
Kanye West and Jay-Z are working on a joint album named 'Watch The Throne'. "We're going to the south of France at the end of this month, just to record new ideas," he said. "We'll probably be done with the album in a day or whatever." He added: "We’ve done about five [songs] so far… but we got some more. But think about it, it's really easy; he only has to think of 10 verses."